Iconic site will show giant hashtags and branded content. Twitter is making its debut on London's Piccadilly Lights with a series of gigantic hashtags, user-focused brand images and a promotion for the upcoming final season of Netflix's House of Cards that take over the entire outdoor site. Going live today (29 October), an opening sequence will feature brand imagery targeted at Twitter users, while from 2 November there will be a marketing push for House of Cards. Twitter will use the digital out-of-home campaign to highlight trending topics, news and "cultural moments" that feature on its platform, balancing commercial content with user-generated material. The DOOH activity will run intermittently on the London landmark's ad hoardings over the coming months and into the new year. Viv Bowdler, Twitter UK's senior marketing manager, said: "Twitter really is what's happening and over the next few months we'll be showcasing the biggest cultural moments that are setting Twitter alight in real time." 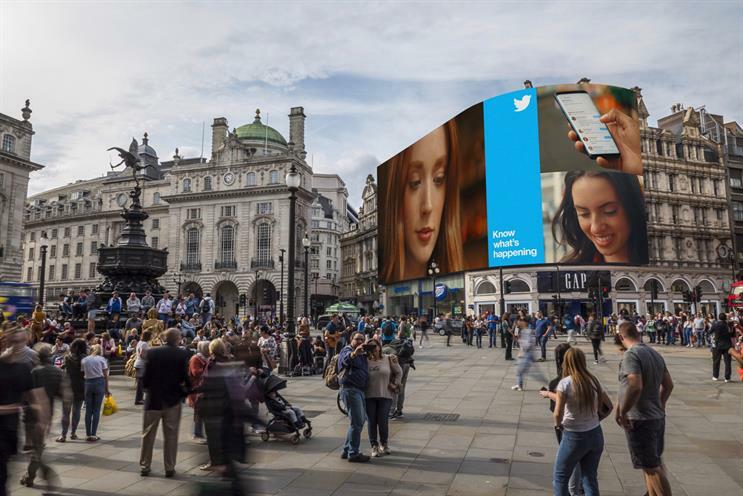 The campaign was created and planned by Twitter in association with Ocean Outdoor, which operates Piccadilly Lights on behalf of Landsec. Chris Standish, Ocean's director of brand partnerships, added: "As one of the most photographed London landmarks, Piccadilly Lights generates millions of shares and user-generated content across social networks every week. Twitter is the first online news and content sharing channel to leverage the power of the world’s best digital out-of-home screen to amplify at scale what everyone’s talking about."